Takes a bit of time - But is worth it! We actually paid full price for once and were still under our £4 budget. This is a rere “Before Cooking” picture as the ribs didn't last long enough for a cooked picture! (1) Add the chopped Onions and minced Garlic to hot oil and fry until softened. (2) Add Chilli flaked and Sugar and stir for about 2 minutes. (3) Add the Ketchup and Soy / Oyster sauce mix and simmer for 10 minutes. 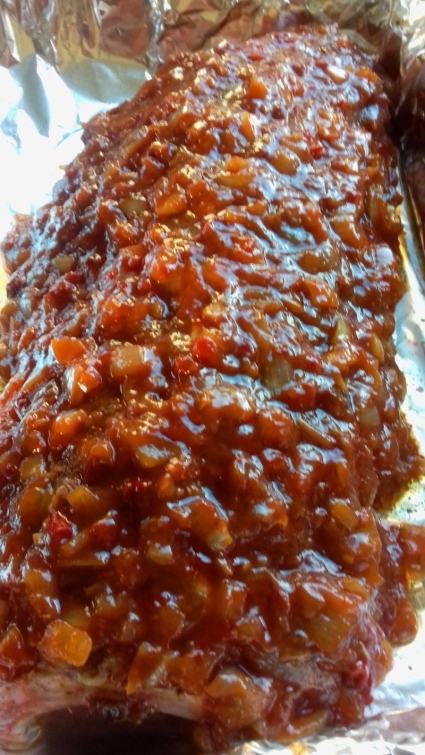 (6) Place the ribs on an oven proof tray and pour over the Marinade. (7) Cover with foil and bake for 2 hours at 180c. (8) Remove foil and cook for a further 30 minutes. We served ours with Potato wedges, home made coleslaw, savoury rice with Spring Onions and Peas.